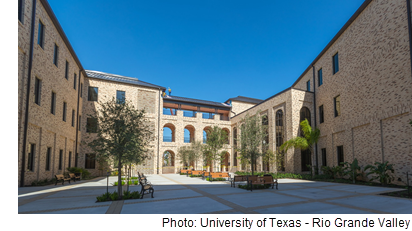 ​​​​​ ​BROWNSVILLE – The University of Texas Rio Grande Valley has finished its ​Music, Science & Learning Center. The project is made up of two freestanding wings joined by a courtyard and a sky bridge. The school of music will occupy three floors in one wing, while the other will house science laboratories, classrooms, meeting rooms, study space, and offices.